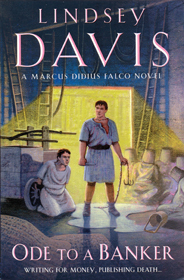 Books 11 and 12 of the Marcus Didius Falco series continue to defy disappointment. In One Virgin Too Many, Vespasian rewards Marcus with middle class status at long last! Along with the new rank comes a new position, Procurator of the Sacred Poultry. The Didius family finds a source of endless laughter and derision as Marcus presides over every sacred festival as nanny to the honorable birds. In this book, Lindsey Davis examines the mysterious cults at the heart of the old Roman religion. When Helena’s brother Aelianus tries to join the Arval Brethren–an exclusive society of corn-husk wearing revelers–he stumbles over the corpse of one of their members, throat slashed and blood drained into a bowl. 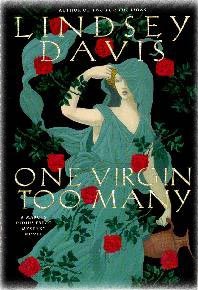 At the same time Gaia Laelia, a six-year-old girl about to be chosen in the rigged lottery for a new Vestal Virgin, gives Marcus the disturbing information that her family is trying to kill her. Are the events connected? And can Marcus stop the second murder before it is too late? In Ode to a Banker, Lindsey Davis tackles both the publishing and the banking industries in ancient Rome. Aurelius Chrysippus, a tasteless Greek who owns a Scriptorium, approaches Marcus to see if he would like to self-publish his poetic scribblings. Outraged that he would be expected to pay the costs of the “printing” himself (ah, vanity publishing! ), Marcus storms away, only to find out that the odious Greek must have outraged someone else that day too. Aurelius Chrysippus’ corpse is discovered beaten to a pulp with the finial of a scroll shoved up his nose, and Petronius Longus (chief of the vigiles) subcontracts Marcus to investigate. As he interviews disgruntled authors, an old first wife, a young second wife, and a spoiled son, Marcus discovers that Chrysippus had fingers in more than one pie. He also owns a bank, entitled the Golden Horse, and his shady business deals there may have run him into more trouble than his lack of literary taste at the publishing house. Lindsey Davis provides a fascinating window into the worlds of finance and publishing, especially interesting to me now that my husband and I have decided to start our own “Scriptorium.” Madison Street Publishing, we’re calling it–has a nice ring to it, no? We’ve bought up a block of ISBN’s, and our next step is to create a logo. Here’s hoping to a kindlier fate and a less gruesome end than that of Aurelius Chrysippus!